Use the Skye Financial Risk Calculator to see if the risk tolerance of your portfolio is right for you. "Whether your finances are a river or a lake--let us guide you"
Skye Financial Services, Inc. is a family owned firm that we formed with the goal of providing clients the opportunity to explore and define their financial destiny. The tenure of our client relationships span almost two decades and in many cases we are honored to serve three generations. Associates at Skye Financial Services, Inc. are also Registered Representatives with United Planners Financial Services, Inc., which allows us to offer clients quality investments and professional guidance to assist in meeting their financial objectives. 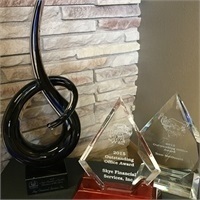 2012 and 2015, 2016 an 2017 Outstanding Office Award for ethical standards and superior compliance efforts by United Planners Financial Services, Inc.
2016 Hartland New Chamber Business of Year Award for integral role in helping the chamber with its mission to serve to enhance, educate and connect business and community. Registered Representatives offering securities and advisory services through United Planners Financial Services of America, a Limited Partnership. Member FINRA and SIPC. Skye Financial Services Inc. and United Planners Financial Services are not affiliated. This information is intended for use only by residents of Arizona, California, Florida, Illinois, Indiana, Kentucky, Minnesota, South Carolina, Washington and Wisconsin. Securities-related services may not be provided to individuals residing in any state not listed above. Insurance-related services may not be provided to individuals residing in any states other than WI, FL and MN. Communication- Your representative will return your calls in a timely manner and be available to meet with you at a time and frequency that fits your schedule and needs. Individualized Service- Your service will be tailored to your unique financial situation and goals. Privacy- We respect your privacy and goals by keeping your information private and confidential.